Rising energy prices have been the first signs of another potential blow to the US economy due to a military confrontation in Syria (see post) - something the US can hardly afford at this stage. Strangely, after numerous shocks the economy has experienced in the last few years, there has been little dialogue about how well the US may be able to absorb yet another shock to growth (combined with sharply higher rates and the upcoming federal budget fight). The conflict also has the potential of delaying the Fed's exit from its securities purchase program, which will add to the uncertainty. But there is a possibility of an even greater blow to global economic growth. A US military involvement in Syria runs a significant risk of spilling over into a regional conflict. In addition to Russian and Iranian interests in Syria, the possibility of Israel's involvement is not immaterial. Those who remember the first Gulf War will recall Iraq's Scud missile attacks against Israel in an attempt to destabilize the coalition trying to liberate Kuwait. At the time, Israel chose to take the hits from these incoming missiles without becoming involved militarily. In the case of Syria however, should the Assad regime choose to use chemical weapons on Israel, all bets are off. Israel will likely take the conflict to a whole new level. Syria currently possesses Scud missiles which are perfectly capable of targeting Israel. In fact the nation's military has been busy moving some of these weapons in preparation for the US attack. Reuters: - President Bashar al-Assad's forces have removed several Scud missiles and dozens of launchers from a base north of Damascus, possibly to protect the weapons from a Western attack, opposition sources said on Thursday. The move from the position in the foothills of the Qalamoun mountains, one of Syria's most heavily militarized districts, appears part of a precautionary but limited redeployment of armaments in areas of central Syria still held by Assad's forces, diplomats based in the Middle East told Reuters. As a comparison to the Gulf War in 1991, the Syria situation is made dangerous by the country's proximity to Israel, improved targeting, and chemical weapons capability. And while Israel now possesses US interception technology, it is by no means impermeable. Israel is certainly taking no chances and has already deployed the "Iron Dome" defense battery in the Tel Aviv area. Furthermore, Israel called in reserve troops and has been distributing large numbers of gas masks to civilians. Adding to the risks, Iran now views a retaliation against Israel in case of a US attack on Syria as a near certainty. FARS News: - A senior Iranian parliamentary official dismissed the possibility of a US attack on Syria, saying that Israel would be the first victim of such a war, if it ever breaks out. "No military attack will be waged against Syria," Director-General of the parliament for International Affairs Hossein Sheikholeslam said on Monday. "Yet, if such an incident takes place, which is impossible, the Zionist regime will be the first victim of a military attack on Syria"
While this looks like a typical belligerent statement coming out of Iran's government, it should not be ignored. Iran has been a staunch supporter of the Assad regime and is extremely well prepared militarily. Global financial markets are clearly not ignoring the risks. 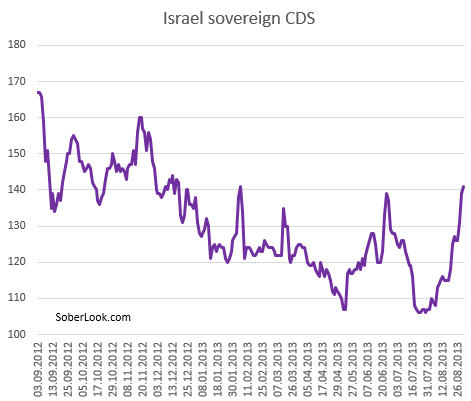 In addition to higher energy prices, regional equity markets have seen increased volatility and Israel's sovereign CDS has popped some 30bp in the last couple of weeks. Let's hope the US politicians and strategists are paying attention to these signals from the markets. Israel's involvement in the conflict could potentially draw in other states - directly or indirectly. The resulting casualties of a broader conflict in the Middle East in terms of lives and damage to the global economy are difficult to fathom. Not only would a US military involvement in Syria be extremely dangerous and costly, it is also unlikely to remove Bashar al-Assad from power unless the US engages on the ground. Even if the regime is somehow forced out, its replacement (which will also possess chemical weapons) could end up being just as dangerous. Americans now have an opportunity to back out of any military involvement in Syria's mess via the upcoming congressional debates. And the majority now agrees that the nation should indeed take this opportunity. Rasmussen (August 31, 2013): - Despite Secretary of State John Kerry’s announcement yesterday that the United States has proof of the Syrian government’s use of chemical weapons against its opponents, just 37% of Likely U.S. Voters think the United States should provide increased military assistance to protect the citizens of Syria. The latest Rasmussen Reports national telephone survey, taken Thursday and Friday nights, finds that 40% do not think the United States should get more involved militarily in Syria.